SDFG Salute the martyrs and wounded of the December 2018 Protests. SDFG Salute the Sudanese protestors who filled the streets in all cities of Sudan. 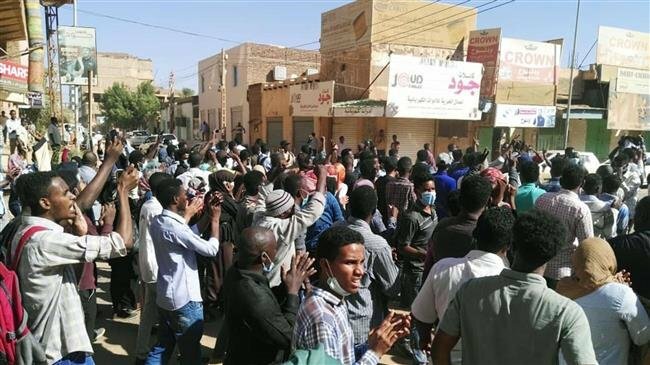 First, the killings and atrocities committed by the Sudan Security and Intelligence Services (NISS), the police forces, and other government militias, are crimes that should not go unpunished. In addition to its violation of the Sudan’s constitution, the international and regional laws and human rights instruments, these crimes have violated all Sudanese customs, values and traditions that respect the sanctity of homes and prohibit beating of children, elderly and women. Since the beginning of the current protest in December 13, 2018 in the city of Damazin and then spread to many cities and towns all over the country, the number of premeditated killings has climbed to more than forty of all ages, hundreds seriously injured and hundreds are still in detention. The Sudanese government’s disregard to the peaceful nature of the protests and the predetermination to use excessive force and live ammunition against the protestors, as well as its disregard to internal, regional and international calls to refrain from the use of excessive force and other forms of repression, is a sufficient proof of the government ill intention and predetermination to kill and seriously hurt protestors to deter further protests. The denial of the government agencies, including the Presidency, of the use of live bullets and the killing of peaceful protestors, does not by all means relieve the government from its constitutional responsibility of investigating these crimes, arresting perpetrators and bringing them to immediate trials. The Sudanese government has announced the formation of a government commission to investigate and assess losses of what it has called the encroachment and destruction of public properties during the first two days of the demonstrations, however, the scope of work of the commission did not include investigating the killing and injuries of peaceful protesters. It is worth-mentioning that, the Sudanese people are very much aware of the partisan nature, lack of capability and limited framework and terms of reference of such commissions of inquiry. A good example of these type commission was the one established to investigate the massacre of more than 200 protestors, committed by the armed government agencies in September 2013, against peaceful protestors. That commission concluded its task by blaming these heinous crimes to unknown persons and Government immediately started financial reparation to the families who lost their love ones in order to close the case and protect the perpetrators. As such, the Sudanese people do not trust these government commission and/or the integrity of the judiciary system and the public prosecution. Hence, SDFG calls upon the United Nations organizations, the Human Rights Council, the International Human Right Commission, regional and international human rights organizations, and all peace, freedom and democracy defenders to exercise the highest possible pressure on the Sudanese Government to accept and allow and independent international inquiry commission, to investigate these latest crimes, in close cooperation with Sudanese human rights organizations, associations of Sudanese lawyers, Sudanese judges and civil society organizations. The task of such a commission is to investigate the massacres and other form of atrocities committed by the armed government agencies against the Sudanese citizens while exercising their constitutional right peacefully. The commission needs to publicly announce its findings and the government should present all perpetrators to a transparent and fair trial. Second, there are persistent attempts by the Sudanese government officials and media, plus international and regional media and decision-making circles in some countries, to attribute the causes of the December 2018 revolt to economic policies implemented by the government during the last quarter of 2018 that resulted in scarcity and high rocketing prices of bread and fuel. Although the poor management of the economy and the ensued hardship is partially responsible, but political impasse, repression, corruption, restriction of freedoms and the performance of the economy in general have been the main causes that drive the Sudanese people to take to the streets and demand the departure of the regime. Moreover, these attempts, by the government and some international and regional actors, to portray these protests as a reaction to the lifting of subsidies, is an ill motivated manoeuvre to undermine the causes of the protests and limit its potential outcomes to a cosmetic alteration of the current regime and hinder the realization of the slogans of the Sudanese people that call for Freedom, Peace and Justice. “Down, that it is…the People Want to Bring Down the Regime…Down! Down with the Kizan (the Muslim Brothers)” and all other slogans that go beyond the economic hardship. People are demanding, without ambiguity, comprehensive change; starting with the departure of the current regime including its personalities, oppressive laws and rules, its racist wars in the marginal areas, its corrupt economic and political systems, its approach to economic and development, its political empowerment policy in the civil service, its media, its culture, its version of Islam, its ideologically based foreign relations, etc. Therefore, SDFG would like to draw the attention of those who want to reduce the revolution of Sudanese people to that it is a bread revolts, to that the roots of the Sudanese current crisis is essentially political, as a result of years the regime bad government scheme. The Sudanese people are determined to realize the goals of their revolution despite all difficulties.